US Army Cpl. 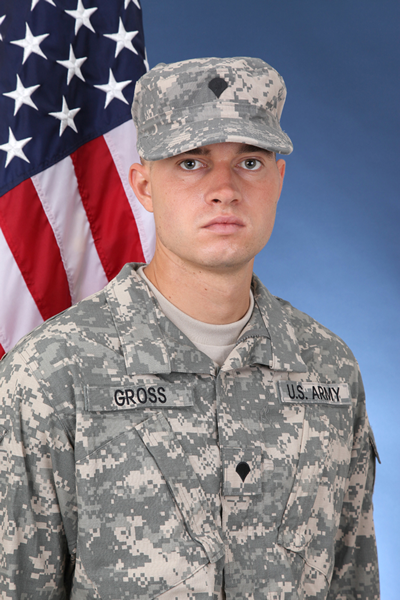 Frank R. Gross was a young man who cherished his family: his father, Craig, his mother, Toni, and his older sister, Natalie. He loved to surf, play golf, fish, and work out. He passionately pursued an education and earned a Master’s Degree in Business from Full Sail University, Winter Park, FL at the age of 24. He focused that same intensity towards his service in the Army and duty to his nation. He graduated BCT Ft .Benning, GA earning the "Expert Marksman Award" and then AIT at Ft. Gordon, GA, he was awarded "honor graduate". Frank also graduated from Airborne School, Ft. Benning, GA.
June 2011, he was deployed to the south eastern border of Afghanistan, Forward Operating Base Spin Boldac, with Charlie Troop, 2 nd Squadron, 38 th CAV Regiment, 504th Battlefield Surveillance Brigade, Long Range Surveillance. July 16, 2011, he died of injuries from an IED blast. His life verse was taken from the Bible, Colossians 3:23, "Whatever you do, work at it with all your heart, as working for the Lord...". These words were branded upon his heart in life, and etched upon his gravestone in death. Awards and decorations include: the Purple Heart, the Bronze Star, Army Good Conduct Medal, National Defense Service Medal, Afghanistan Campaign Medal with Bronze Service star, Global War on Terrorism Service Medal, Army Service ribbon, Overseas Service Ribbon, NATO medal, Overseas service bar, Combat Action Badge, Parachutist Badge, Combat and Special skill badge, Basic Marksmanship Qualification Badge Bar and Weapon (Rifle) Expert.